Physical activity, sport and exercise are a fundamental part of treatment for osteoporosis as they build strength, improve posture and help with falls prevention. There is a close connection between our bones and muscles which work together to support us, give us strength and allow us to move. Osteoporosis treatment focuses primarily on promoting bone formation, slowing bone breakdown and preventing fractures. Exercise has a key role to play too. Physical activity strengthens muscles and develops stability, balance, a steady gait and a sense of equilibrium. Strength gives us good posture and allows us to keep active while a steady gait, sense of balance and equilibrium help us walk and stand with ease and minimise our risk of falling over. Falls present the highest risk to people with osteoporosis and should be avoided at all costs. Falls are the main cause of fractures in older people: if you reduce your risk of falling, you greatly reduce your risk of breaking your delicate bones. Appropriate strength training is therefore recommended as part of osteoporosis treatment. You don’t have to join a gym or take up boxing but you should look to exercise a little each day to enjoy the benefits. Walking, swimming and running are all excellent forms of exercise as are playing tennis or badminton. Many leisure centres have low impact classes for people who need a gentler form of exercise and many have specific classes for falls prevention. The secret is doing a variety of activities, little and often. Falls are rarely attributable to one single cause; usually several factors play a role. Weak lower leg muscles, poor co-ordination and loss of balance raise your risk of falling. Falls occur more frequently with advancing age: ironically at a time of life when the impact of the fall can have serious consequences. People with osteoporosis invariably sustain one or more fractures if they fall. About 30 percent of over-65s fall once a year or more. Fractures can be very serious: 80 percent of femoral neck fractures (most commonly referred to as hip fractures) are connected with a fall, while fractures in the upper and lower arm and pelvis are also very common. Falls prevention takes on particular significance for people with osteoporosis as their brittle bones make them more more prone to fractures when falling. Taking regular exercise is as much to stop you from falling as it is to keep you fit and well. Falls among older people usually occur when simply doing everyday activities and most often these falls occur at home. Simple exercises to promote postural stability and helping people stay steady on their feet can make a big difference. It is known that the number of falls among elderly people increases with their age and women fall more often than men. Furthermore, elderly people fall to the side more often, which can lead to impact on the hips and result in the much-feared hip fracture which can leave people bed-ridden. 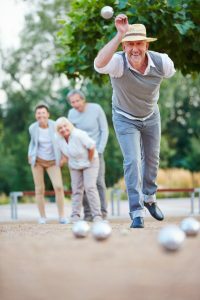 Coordination and postural stability play an important role in falls prevention among the elderly. Undertaking balance and equilibrium training every day can help avoid a fall and prevent injury and fractures. People with osteoporosis can gain significantly from exercise to promote good mobility, strength, coordination and speed of reaction. The latter two are crucial: after all, strength is not much use if a person lacks coordination or can’t respond quickly enough to a falls risk. Training on the Marodyne LiV treatment system promotes bone build-up. Simultaneously, the calf muscles are stimulated intensively while standing on the platform which promotes postural stability and balance. The calf muscles help to hold the body upright position: along with the feet, they compensate for uncertainties when walking and standing. Strength in the lower legs, combined with the ability to react quickly when challenged by an imbalance, will greatly reduce a person’s risk of falling. When unbalanced and about to fall, the body reacts with a coordinated reflex resulting from the interaction of the brain and muscles. This reflex is involuntary and rapid: no conscious thought is required. However, in order not to fall, the muscles must be strong enough to hold the body upright when the reflex to steady oneself is triggered. A key objective in falls prevention therefore is to build up sufficiently strong muscles. There is more to muscles than simply the shape and strength we see or feel in our arms and legs. When we have the feeling in old age that our strength is declining or the muscles are getting weaker, this is due to internal, metabolic changes that are barely perceptible from the outside. A large number of metabolic processes are determined by the work of the muscles including the heart. This in turn affects a person’s circulation and return blood flow to the legs, including the all-important calf muscles. Tiny muscle fibres we cannot see control a large number of processes in our body. We have thousands of tiny little fibres in our muscular system whose activity takes care of our metabolism: their action is constant but unconscious: we are neither aware of the work they do nor can we influence it. Like our more familiar, larger muscles controlled by our brain, these tiny muscles consist of a range of cells and fibres with different characteristics. Both lines show muscle fibre activity. The blue line (above) represents a younger person while the red line (below) represents an older person. The age-related decline in fibres and their activity become markedly noticeable from about the age of 50. The aim of the Marodyne LiV treatment is to activate these important muscle fibres, promote their function and maintain their quality. There are three types of muscle fibre with different characteristics regarding movement, activity, strength and endurance. The type 2A muscle fibres are of particular importance to bone remodelling. In a younger person, the type 2A muscle fibres contribute to the stimulation of bone growth via building cells (osteoblasts) during metabolism. In skeletal muscles, they stimulate the bones by subjecting them to tiny loads which stimulate bone build-up. 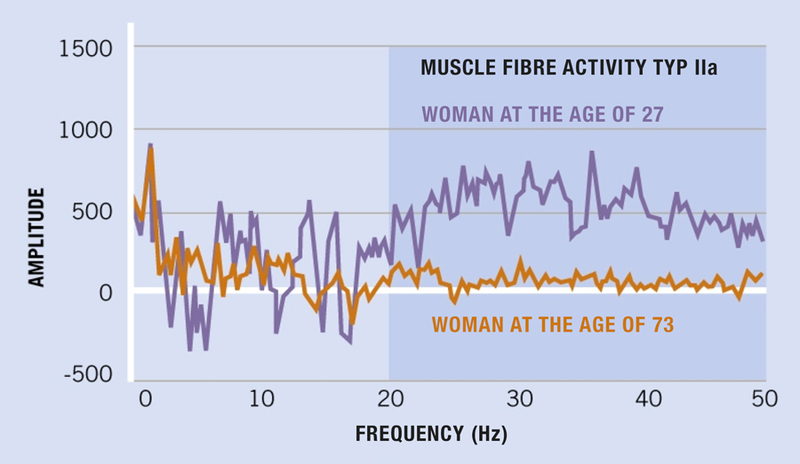 This muscle activity declines with age but can go unnoticed for years. Decreasing activity levels result in fewer load stimuli from the muscle fibres acting on the bones. This leads in turn to the gradual degeneration of bone substance. The role of physical exercise helping to stimulate the activity of type 2A muscle fibres in people with osteoporosis is well documented in studies. Treatment with the Marodyne LiV system has been shown to stimulate the type 2A muscle fibres, making it an effective training system to help counteract osteoporosis. By also building the calf muscles and boosting circulation it has additional benefits. Marodyne LiV was designed to imitate the activity of type 2A fibres to boost the frequency of their movement to increase the load on surrounding muscle tissue. By producing this essential stimulus for type 2a muscle fibres it helps older and inactive people whose bodies can no longer produce the required level of muscle activity on their own. Sport and physical exercise are not just about muscles. Bones need to be subjected to forces to build their strength and will do this when subjected to loads (as explained in Wolff’s Law). 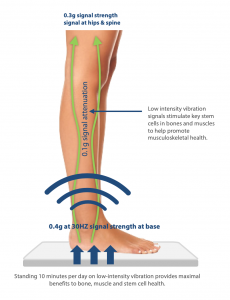 Low intensity Vibration (LiV) offers a very gentle yet highly effective way to promote bone build-up in a targeted manner. Marodyne LiV treatment subjects the body to peak dynamic forces – which directly stimulate the activity and formation of bone building cells (osteoblasts). These stimuli are closely related to the behaviour of the body’s type 2A muscle fibres and activate the bones, muscles, metabolism and cardiovascular system. These combine to promote healthy, stable bones even in people with osteoporosis. When it comes to choosing exercise to train the bones, variety is best. A range of different activities will combine to good effect but it’s important you choose what you enjoy as you are more likely to do this regularly. Sports that carry a low risk of injury are recommended: for example special gymnastics sessions for people with osteoporosis include precise exercises to encourage strength and balance. Swimming is another low-injury exercise: while the impact on the bones is next to nothing, swimming and aqua aerobics are very good for strength, muscles and circulation while sparing the joints from impact. Bouncing on a trampoline is excellent exercise to boost bone health. While the risk of falling is high, for older people able to manage the activity it has little impact on bones but the smooth, flowing movements boost circulation and stimulate muscles, especially in the leg and core to maintain balance on the trampoline. Building strength in these muscle is key to falls prevention so trampolining is well worth doing – plus it’s a lot of fun. Marodyne LiV treatment system supports bone build-up and supplies the skeleton with gentle peak forces. But it must be done a little and often to gain the benefits: 10 minutes’ training a day is all you need to generate the optimum 18,000 shock stimuli needed to bring results. Muscle building and physical training are important, generally in old age and especially with osteoporosis. However, very few types of sport trigger the peak forces essential for bone build-up. Furthermore, the sports that can trigger this activity tend to carry a higher risk for older people and those with osteoporosis. Low intensity vibration (LiV) can create these peak forces safely and in comfort with just 10 minutes’ a day needed to create the 18,000 shock stimuli needed for therapeutic rehabilitation results. Low intensity Vibration (LiV) is a very gentle and highly effective treatment, which supports bone build-up in a targeted manner. The treatment gives your skeleton dynamic peak forces which simulate the activity and formation of bone building cells. Current studies demonstrate a crucial difference in the training of muscles and bones. While muscles react to movement and load, bones are best stimulated using shock stimuli – tiny loads in the form of peak forces that are repeated frequently. Therefore, any kind of strength and endurance training from traditional sport and physical activity should be accompanied by appropriate and gentle, low intensity vibration training. This way the exercise will stimulate muscles while the LIV will stimulate the bones resulting in the optimum increase in strength and stability needed to offset osteoporosis.